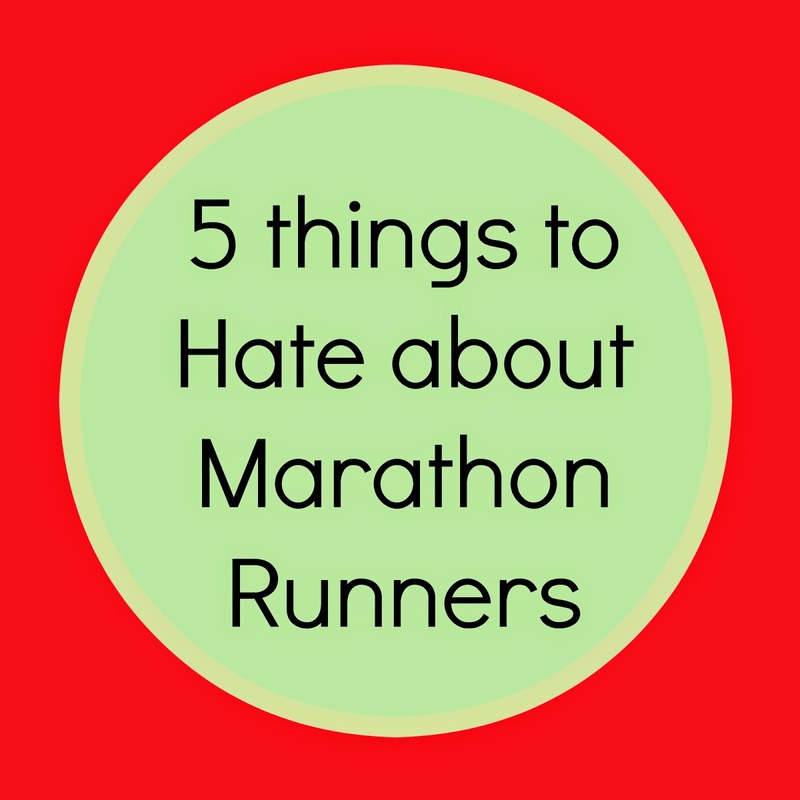 Fairytales and Fitness: Five Things to Hate About Marathon Runners, Really? Seriously! I am getting so tired of people bashing running. I guess haters will hate and running is the hated thing du jour! Did you see that article that came out that said just running 5 minutes a day can add years to your life? Now THAT'S what I am talking about! I actually saw something like that on the world news the other night! People need to be more positive, right? I hate that post. It is really annoying when people bash those who run marathons. Yea, That guy really has too much time on his hands to be sitting around bashing marathoners! Nothing wrong with that at all Sue! omg, is this article for real? or a joke? Lol. I like Gu by the way! LOL. I must be really annoying, I have 2 26.2 Boston stickers on my car!!! :0 I'm going to share this with my runner buds....I think they'll get a kick out of it. I'm thinking he was serious. Probably written just to get a reaction from people. Is this author intentionally trying to poke just for the sake of getting a response? C'mon...who really spends so much time thinking out line items to hate about random strangers? People just love finding things to criticize other people for! Maybe he should try running sometime. I know the guy meant it as a joke, but it is pretty poor taste! I read his newer one that was 5 more ways he hates them, and it wasn't any better. You know whats funny, anyone who runs knows runners come in all shapes and sizes, and I can't tell you how many "heavier" people I have seen pass up skinny runners who don't even have 1/2 the endurance as someone twice their size. Being in shape and being fit mean different things to different people, and I don't think anyone should criticize that even if they are trying to be funny. So funny because after we read that article we went on a bike ride and we started paying attention to people's bumper stickers! Obviously he has nothing better to do than poke fun at people. Even though it's super old from 2010, I HATE #2. I'm fat and I've run 4 marathons training for my 5th. I might never be not fat, but I'll always run marathons. On the other hand - $90 for Chicago marathon? I paid $165!!! You go girl! And yea, I thought $90 was a steal, but like you said it was from 2010. Hmm, I wonder if this guy still feels the same way now. I thought the article was...stupid. Some runner bashing articles are kinda funny/kinda true and therefore clever. This just fell short in many ways - he was trying too hard. That was the dumbest side note about "pace". What the hell do you want us to say? I tilt my hat to people who can be funny but still get their opinion out. Not this person. Clearly, the author of this article is a hater! haha. This who can't, just hate on it. Very interesting article. I wonder if this author wrote this on purpose - to piss people off OR s/he actually feels that way. I know everyone has the right to speech, but damn! It was rough just reading that. Yeah, I remember reading this and thinking it was stupid. I know it was meant as a joke but it just wasn't funny. And what's up with the comment tha tyre not burning through calories at 15 minute per mile? You're burning a ton of calories going 26.2 miles on foot, no matter what speed. Obviously this person has no big dreams except for to try and crush people's spirits. I have news for this person - marathoners/racers in general are the WRONG people to target to crush spirits! We are way stronger than his words! As they say though, haters gonna hate lol! Wow it was tough to read that article. What a loser. Especially his comment about "fat" marathon runners. Get a life, is what I would tell the writer of that article. That article says a lot about the writer as a person and absolutely nothing about marathoners, because clearly that person is writing with all the intelligence and tact of a mean bully in gradeschool (that is, if he read this post, I would expect his response to be, "I know you are but what am I?" with some bird-flipping and name-calling for good measure). I'm happy he doesn't like marathoners, though, because who wants to run a race with such a negative and hateful person? Love your take!! This guy is writing for parody or is just so jealous of people who can actually go the distance (maybe he's compensating for his other "shortcomings"...lmao). If this applies to half-marathoners, I've totally been the girl out or at a party not drinking and cutting out early for my 6:30am 10 miler the next day! And I don't drive a Prius or Subaru either, but if I put stickers on my car I certainly would (maybe I should get a magnet?). Maybe I should tell him how I actually GAIN weight when I'm in full training mode!